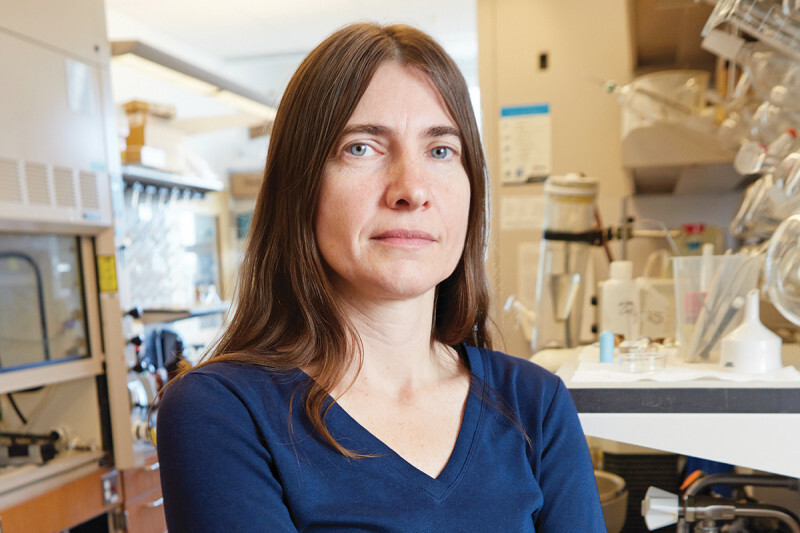 Drug discovery is “a long, complex effort,” says chemical biologist Gabriela Chiosis, a member of the Sloan Kettering Institute’s Molecular Pharmacology and Chemistry Program. She should know. The journey to the discovery in her laboratory of how a small molecule can be used to block the activity of a cancer-promoting protein began more than a decade ago. Dr. Chiosis’ laboratory brings together experts in biology, chemistry, and medicine to investigate proteins called chaperones, which help maintain a cell’s function by assisting other proteins to fold properly. In some diseases, however, the protective function of chaperones has the paradoxical effect of stabilizing a variety of proteins required for tumor growth and progression. One such chaperone protein is called heat shock protein 90 (Hsp90). As its name suggests, heat shock proteins protect cells when they are stressed by high temperatures, but Hsp90 is also known to play a role in cancer, as well as in some neurodegenerative diseases. “Hsp90 is a very promising target for cancer therapy,” Dr. Chiosis says. In 2005, she and her colleagues discovered a small molecule called PU-H71 that blocks the activity of Hsp90. “It was recognized at the time as an important finding,” she recalls. Next, she and her collaborators began exploring the biology of PU-H71 and how best to develop the compound into an agent that could be used clinically. What they knew was that certain cancers are “addicted” to the activity of Hsp90, and that it would be these tumors that would be most sensitive to therapy with PU-H71. The investigators needed a way to select patients who had cancers with increased reliance on Hsp90. It became clear that attaching a radioactive label to PU-H71 could allow them to identify Hsp90-avid tumors. Working with MSK’s Departments of Radiochemistry and Radiology, Dr. Chiosis’ laboratory developed a radioactively labeled version of PU-H71. In early investigational clinical studies now ongoing at MSK, patients are given PU-H71 labeled with a very small amount of radioactive iodine, enabling doctors to perform PET scans to visualize how the drug is taken up in cancer cells. We're not just giving a drug and crossing our fingers hoping that something will happen. We have a way of monitoring what we are doing in every tumor. It is patient specific. In their early studies, Dr. Chiosis and her colleagues are focusing on the use of PU-H71 in several cancers, determined by the presence of Hsp90 activity. Which cancers are known to be heavily reliant Hsp90? Is Non-Hodgkins Lymphoma one of them? Thank you. David, we forwarded your question to Dr. Chiosis, and she said, “Most types of cancers (including NHL) contain subgroups that are heavily reliant on Hsp90. So far, our experience suggests that this number could be about half of all cancers overall. The use of the PU-H71 PET scan is now being explored to identify those most likely to benefit from Hsp90 therapy.” Thank you for your comment. Does Hsp90 stabilize the mutant proteins such as v-Src in cancer? Leah, according to Dr. Chiosis, the answer is yes, it does. In fact Hsp90 was discovered in 1981 as a protein that interacted with v-src in cancer cells. Later, in the early 1990s, two key papers established that through this interaction, Hsp90 regulated the activity of v-src. A review on this topic can be found at: http://clincancerres.aacrjournals.org/content/13/6/1625.full.pdf+html Thank you for your comment. How about Colon Cancer? Can Hsp90 be a target for Colon Cancer Therapy as well? Emine, some early research has indicated that inhibiting Hsp90 may be effective against certain cases of colon cancer. Thank you for your comment. Can Hsp be a target for rectal cancer and for rectal cancer that has mestatisized to the lung. Thank you. Brenda, most types of cancers contain subgroups that are heavily reliant on Hsp90. MSK has a clinical trial under way to determine whether the PU-H71 PET scan can identify those tumors most likely to benefit from Hsp90 therapy, including which metastatic tumors may benefit. If you would like to learn about participating in this trial, you can call our Physician Referral Service at 800-525-2225. Thank you for your comment. I have neuroendocrine tumors. Would this treatment be effective on these? Gail, PU-H71 is still in the early stages of testing and we don’t yet know which types of cancer it will be effective against, but for most cancer types there is a subset of tumors that are reliant on the Hsp90 protein. If you’d like to make an appointment you can call 800-525-2225 or go to http://www.mskcc.org/cancer-care/appointment for more information. Thank you for your comment. Can this targets approach be used on melanoma tumors? If you or a loved one is interested in this study, you can call 800-525-2225 or go to https://www.mskcc.org/experience/become-patient/appointment for more information on making an appointment. Thank you for your comment. Donna, for patients whose appendix cancer has progressed after systemic chemotherapy (such as the FOLFOX or FOLFIRI regimens), MSK currently has clinical trials with targeted agents that are selected based upon the genetics of the tumor. If you’re interested in these trials, you can call 800-525-2225 or go to https://www.mskcc.org/experience/become-patient/appointment for more information on making an appointment. In addition, we are currently working on a new section of our website that will discuss treatment for appendix cancer, so you may want to check back to our site in a few weeks. Does this drug target all the isoforms of Hsp90? And is Hsp90 indicated in small cell lung cancer? Hi Anjali, we forwarded your questions to Dr. Chiosis, and she said that the drug does target all the isoforms of Hsp90. To learn more about its indication for small cell lung cancer, you can refer to http://www.nature.com/nchembio/press_releases/nchembio0807.html. This press release describes research by Dr. Chiosis and her colleagues showing the role of Hsp90 in small cell lung cancer. Thank you for your comment. What is the latest & most effective treatment for metastatic breast cancer in the liver? Hi Jasper, there are a number of treatments for metastatic liver tumors. To learn more about how MSK treats these tumors, you can go to https://www.mskcc.org/cancer-care/types/liver-metastases/treatment. We also have several trials for targeted therapies in breast cancer that may be effective against these tumors. If you’d like to make an appointment you can call 800-525-2225 during regular business hours or go to https://www.mskcc.org/experience/become-patient/appointment for more information on making an appointment. Thank you for your comment. Dear Jacob, we’re sorry to hear that you’re experiencing pain. We recommend that you discuss this with your healthcare team. There are several good options for controlling pain from metastases. Thank you for your comment, and best wishes to you. Would this approach be any useful in Metastatic Adenocarcinoma of the Pancreato Biliary Origin? Dear Mahid, development of this drug is still in very early stages and it’s too soon to know which cancers it may be effective in treating. Thank you for your comment, and best wishes to you.